The insignia of the Fraternity are symbols of great meaning. They are a heritage from the past, significant because of what Zeta Tau Alphas believe. Badge – The badge of the Fraternity is a small, black, enameled shield super-imposed upon a gold shield, bearing a five pointed crown with the letters ZTA arranged around it, and below it the word “Themis” in Greek. Banner – The banner of the Fraternity is rectangular and made of turquoise and gray satin. It bears the letter “A,” the word “Themis” in Greek, and a burning torch. The meaning of the banner is secret, but it may be hung in a place that is visible to anyone entering a chapter house, lodge, suite or chapter room. Chain of Chapters – A gold link inscribed “Alpha” begins Zeta Tau Alpha’s Chain of Chapters. Each time a new collegiate chapter is installed, a silver link, etched with the chapter’s Greek name, is added to the chain. Colors – The colors of Zeta Tau Alpha are turquoise blue and steel gray. The significance of these colors is explained in the Initiation Service. Coat of Arms (Crest) – Only initiated members may use wear or use the crest. The ritualistic meaning of the Coat of Arms is secret and is revealed to each member at the time of her initiation. 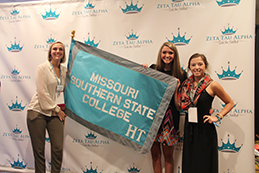 Corporate Logo – Zeta Tau Alpha’s current logo was unveiled at Convention 2014. This important piece of the ZTA brand makes the crown the prominent, identifying symbol of the Fraternity. Flag, Chapter – In honor of ZTA’s Centennial (1998), a flag was produced to honor each Chapter. The flags are gray and turquoise with the Chapter name in Greek letters. A flag will be made for each successive chapter upon its Installation. The flags are housed at International Office. Flower – The flower of the Fraternity, chosen by Founder Ruby Leigh Orgain, is the white violet. Its symbolic meaning is explained in the Initiation Service. Honor Ring – Adopted at the 1915 Convention, it is silver with the Coat of Arms upon a turquoise stone, flanked by an open Bible and the crown. It is the highest individual honor granted by the Fraternity. Upon approval of National Council, alumnae may receive the Honor Ring for outstanding and sustained service to the Fraternity. Presentation of the Honor Ring is based upon a point system for service on the local and national level. Mother’s Pin – A turquoise and silver crown with a white violet embossed upon it, this pin may be presented to mothers of initiated members and to Zeta house directors. Official Seal – The official seal of the Fraternity is circular with fluted edges bearing the name of the Fraternity and the date and place of founding. It is used on official documents of the national Fraternity. Replicas of the official seal may be used for decorative purposes. Patron Goddess – The Founders chose Themis to represent the Fraternity. In Greek mythology, Themis is one of the Titans, daughter of Gaea (Earth) and Uranus (Heaven), and the mother of the three Fates and the Seasons. The goddess of divine justice and law, Themis was the constant companion of the god Zeus and sat beside him on Olympus. In ancient art she is represented holding aloft a pair of scales on which she weighs the claims of opposing parties. Pledge Pin – This pin is a silver carpenter’s square enameled in turquoise, to be worn by all duly pledged new members of the Fraternity. 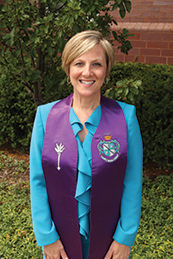 The Purple of the Fraternity – The purple of the Fraternity is the purple regalia, adorned with the torch and Coat of Arms, worn by the National President as a symbol of her office. It is worn at all official Zeta Tau Alpha functions such as Convention Business Meetings and chapter Installations. Recognition Pins – The ZTA recognition pins may be worn by new and initiated members. The crown pin may be worn by initiated members only. Strawberry – An admirer of one of ZTA’s Founders, Mary Campbell Jones (Batte), sent her a gift of strawberries. The delicious present prompted the group of nine friends to host their first purely social gathering and to become officially recognized as a campus organization. White Violet Pin (50 year pin) – Only those who have been members of the Fraternity for 50 or more years and thus are recipients of the Order of the Shield may wear this pin, in the shape of the white violet. It may be worn as a recognition pin or as a guard to the badge. White Violet Charm (75 year charm) – Those members who have been a member for 75 years receive this charm which is in the shape of the white violet with 75 superimposed upon it.